Masquerade balls date back some 600 years and are inextricably linked with the Italian city of Venice during which they would take place during the Carnival season. Party-goers would dress up in fabulous outfits with masks to hide their identity and that’s the theme of this online slot from Play N Go. It’s called Royal Masquerade and you can read all about it below. 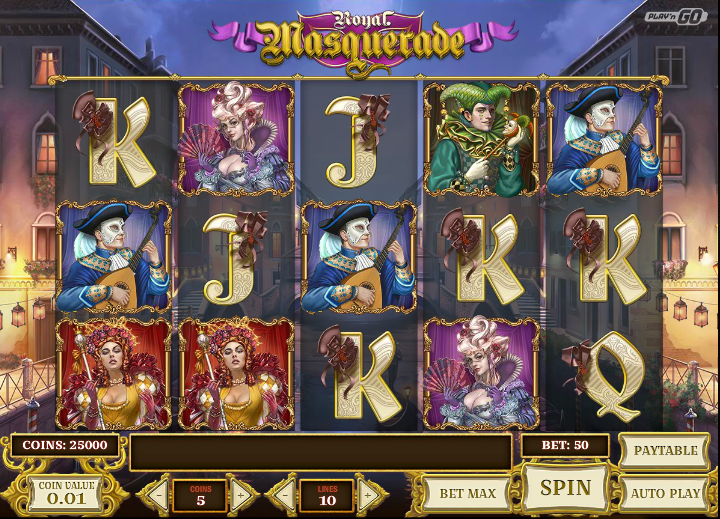 Royal Masquerade is a five reel slot with three rows and up to ten paylines; through the transparent reels there’s a detailed view of a Venetian canal with houses rising up on either side. Small lanterns sway in the breeze as night draws in. The five high value symbols are intricately drawn party-going characters and if you look closely you’ll see that each one moves ever so slightly; 10, J, Q, K and A make up the lower values but each is accessorised. The wild symbol is a blueish mask with a long beak and it substitutes for all other symbols except the scatter; the scatter is a glowing gold mask which activates the main feature. This feature is triggered by landing three or more of those dazzling gold masks anywhere in view for which you will receive five free spins. Five spins may not sound too generous but each one is guaranteed to be a winner; additionally each time one more gold mask lands on the reels you will receive two more spins so it’s quite easy to increase that initial number. There’s an upper limit of twenty spins for those who are lucky enough to win more spins. Any wins can be gambled by clicking the ‘Gamble’ button below the reels; try and double or quadruple that amount by guessing the colour or suit of the next card drawn. If you’re only here for the free spins then you can reduce your paylines to one and still have the same chance of triggering that feature with the scatter symbols. You’ll win proportionately less though. 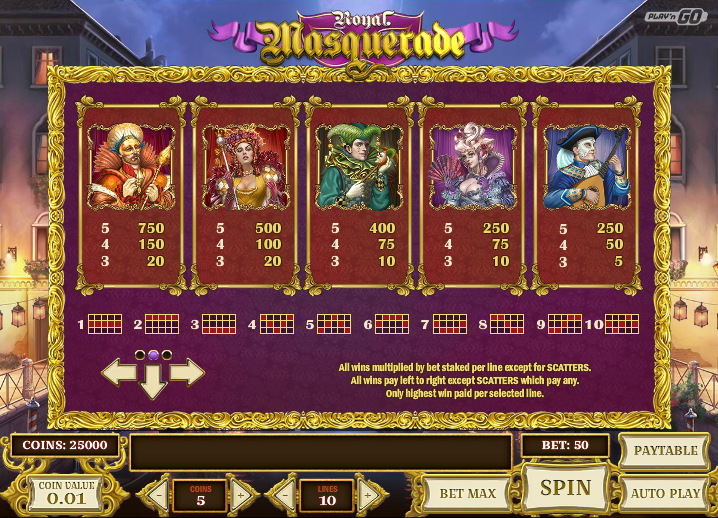 Royal Masquerade is a fantastic-looking slot with some detailed graphics and subtle animations; our experience is that it’s a little tricky to trigger the spins but there are some big wins on offer if you can. The RTP is 96.51%.